Welcome to the North Petherton Community Centre web site. If you're looking for something to do in North Petherton you've probably come to the right place! Over 20 clubs, societies and organisations meet at the centre regularly, offering a wide range of activities to suit all sections of the local community, from exercise classes, sports and youth organisations, to bingo, a flea market and the community meeting point Café Connect. Then there are occasional special events too, ranging from beer festivals to art fairs. While we are at the centre of a thriving community, we do have spare slots in our schedule for both regular and one-off bookings - and we do have some excellent facilities available to hire! In addition to a large main hall, bar and spacious kitchen, the community centre also has a second smaller hall with its own separate entrance, kitchenette and toilets, so it's easy to have several separate events happening in parallel. Alternatively you can use the link between the two halls and hire the entire community centre. So, whether you're thinking of starting a club, planning a party or wedding reception, or want to hold a conference or exhibition, do take a look at our venue hire and hall bookings section. We are right in the middle of North Petherton, with good access to the M5 and with parking right outside, so we couldn't be more conveniently located for visitors. You can now find a clothes recycling bank in our car park which, we hope, will provide a useful community facility as well as contributing to our funds. 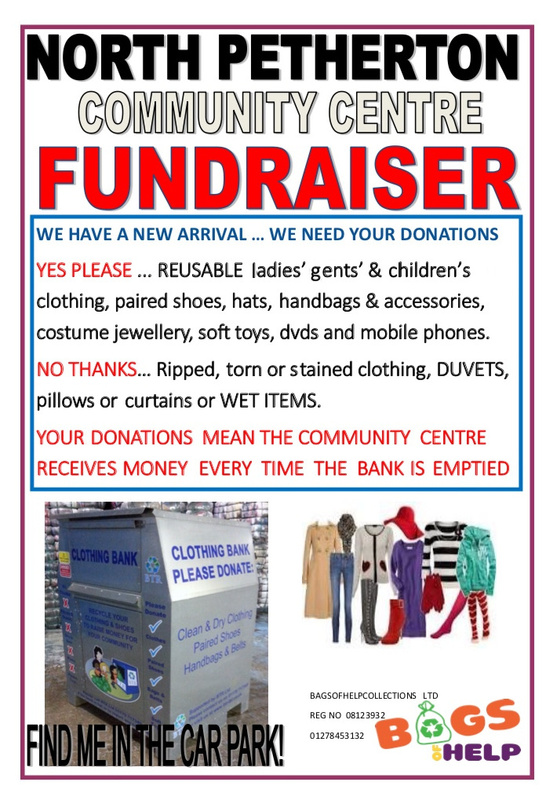 This is for good quality reusable clothes and accessories only - for full details please see this poster.